Humans are wimps. Sure, we live in scorching deserts, freezing tundra, and steaming rain forests, but we create friendly microcosms in which our tender bodies can survive. Northerners may think we're tougher than our tropical cousins because we can function when it's -40 outside, but take away our thermal clothing and heated dwellings, and we would turn to ice cubes just as fast as the Tahitians or the Javanese. 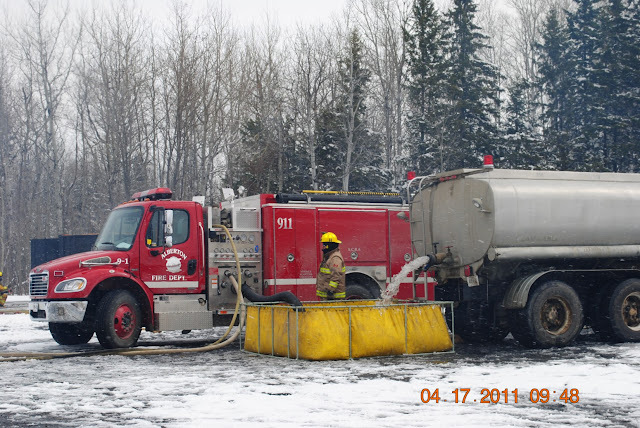 Firefighters take the 'friendly microcosm' idea a step further. We wear personal protective equipment so we can venture into hostile environments without getting fried, frozen, suffocated, or poisoned. Bunker gear, thermal entry suits, SCBA, and chemical protective clothing create a mini environment that insulates our fragile systems from the hazards of the job. People think of firefighters as tough dudes, but our skin burns or freezes just as fast as that of the pen pusher or keyboard typist. We condition ourselves to broaden out that survival range ever so slightly, but the fact remains that if our body core strays a few degrees from a comfortable 36.5 C, or if the oxygen level in air we breathe drops much below the normal 21.9%, we get into trouble just like everyone else. 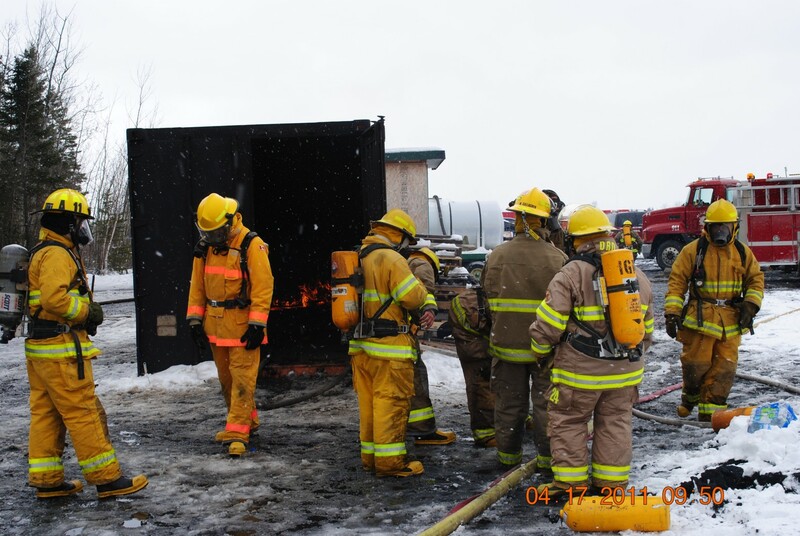 Last weekend we ran a firefighter boot camp for twenty three Fort Frances area volunteer firefighters. A good portion of the training was aimed at making them comfortable in their PPE microcosms. 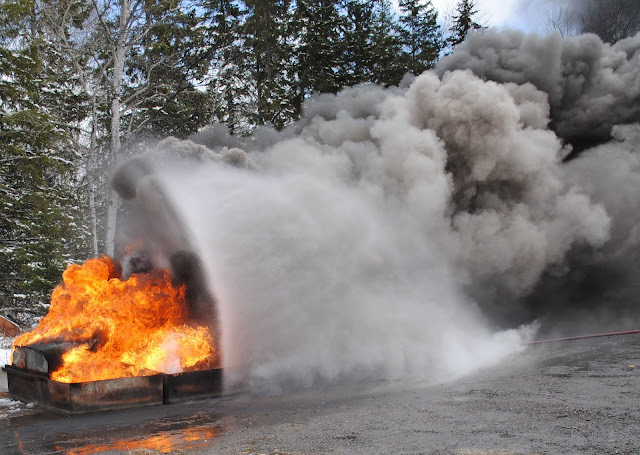 They trained on ladders and hose streams in a blizzard, crawled blindfolded through a claustrophobically dark and narrow training trailer, and snuggled up to smoke and heat that would wilt the toughest unprotected macho man. Normal people spend their weekends in comfortable places, like a sunny beach in Cancun, or a soft couch by the fireplace. The hardy ones among us might take a trip to a ski hill. Not these folks. They volunteer to dress in smelly turnouts, strap a mask to their faces and work themselves to the bone for twelve or fourteen hours a day. Volunteer firefighters are indeed strange people. 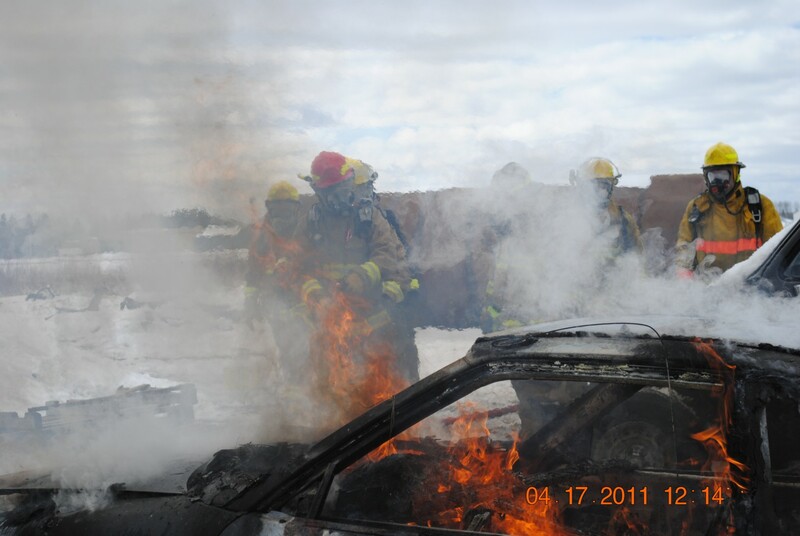 Here's a crew learning the ropes on an exterior class A fire. Here's an interior class A attack crew winding down after an evolution in the "can." 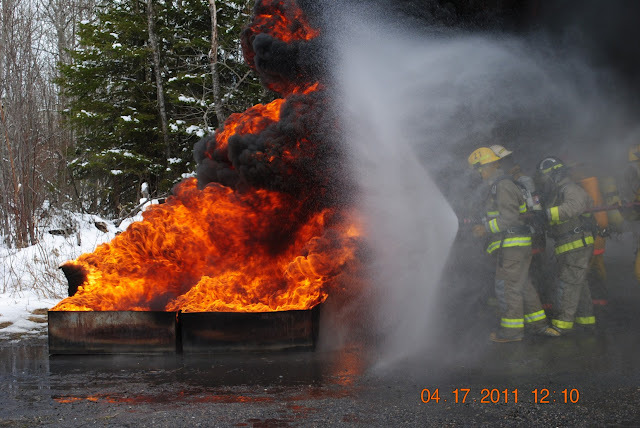 The class B fires are lots of fun, and give a practical demonstration of the microcosm created by PPE and water fog. Here we are, deeper into the hostile environment, still protected by the friendly microcosm. Car fire evolutions are universally popular. Everyone fights car fires, even firefighters on the peripheral edge of the universe. Water supply isn't a glamorous job, but the rest of the training would come to a screeching halt without these guys. Sometimes councils and mayors and bean counters wonder if we really need all those fancy toys. Perhaps we should invite them into our microcosms and show them what would happen if a decrepit pumper failed or an aged hose blew at the critical moment. I saw firefighters last weekend wearing decades-old equipment. If that microcosm is compromised while a firefighter is in a hostile environment, it's game over. We're still fragile humans underneath, just like everyone else. The Newfoundland government apparently is getting the message. They just tabled a budget that includes a tax credit for volunteer firefighters, and a grant for 22 new apparatus. Even a political agnostic like myself has to applaud the fire service leaders that braved a hostile environment to lobby for this funding. By the way, if you don't think politics is a hostile environment, you haven't been listening to the campaign ads. Speaking of politics, my latest post (in which I encourage you to use your voice) is up at the CVFSA blog. 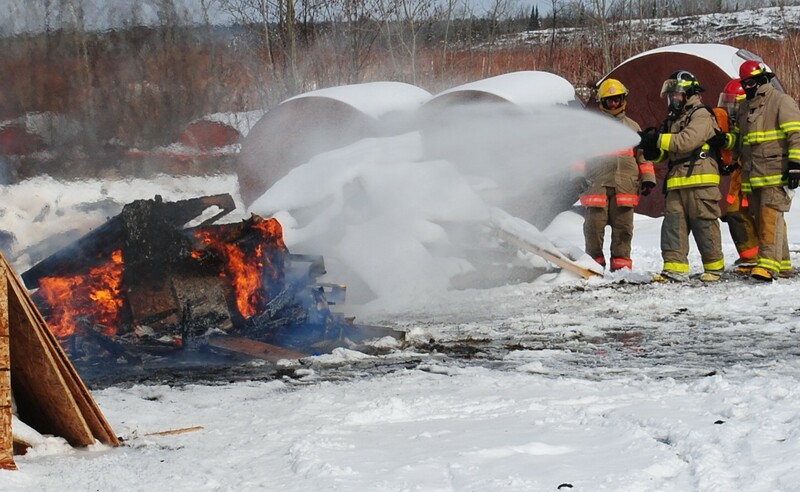 We can all take a hint from the intrepid Newfoundland and Alberta fire services, who have both won significant victories at the provincial level. Perhaps we can build on that momentum at the federal level. It's time to don your metaphorical SCBA, and head to your local politician's office. They need to know that the volunteer firefighter microcosm is in danger of being compromised. We know what will happen if it is, but do they?